Romance and flowers are the theme of this beautiful affair captured by Vanessa Lust Photography at God’s Mountain Estate. Spectacular real couple Kira and Nate were the centerpiece of the design by White Event Studio and Celsia Florist. We love the Rime Arodaky gown and Naturae Design headpiece provided by Union Bridal. The gild on the lily by Jenny McKinney Makeup Artistry. The white on white feel of this design affair creates a lovely magical backdrop for pale flowers and tasteful cuisine. The artfully arranged drapery and hanging greenery draw the eye to the detail filled table scape of this west coast wedding. Enjoy the pretty! Our Favourite Things at this Wedding Affair! We loved the cut out back, the casual groom’s clothing, the gorgeous florals…but, in the end, we have to admit it the tablescape that really drew our eye! 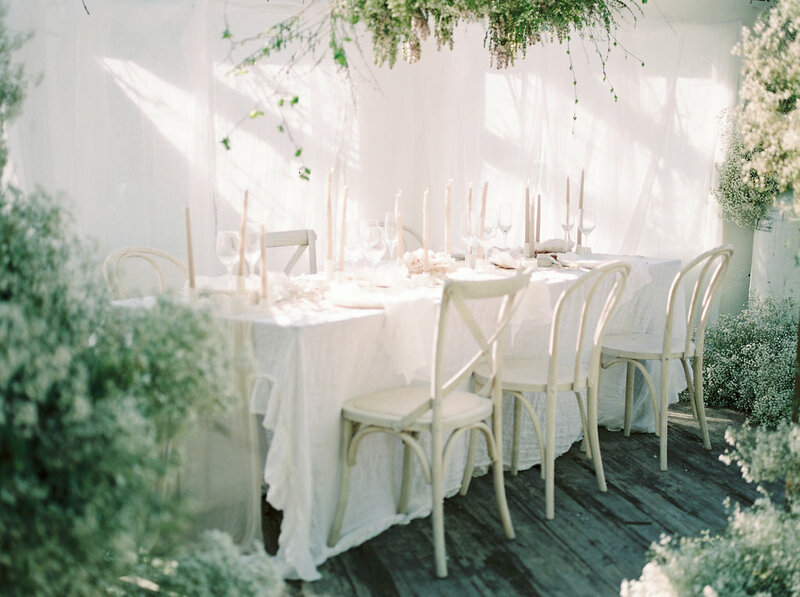 The white on white is stunning alongside the crisp green leaves hanging over the table! You are invited to more romantic wedding editorials!